Here’s the story. This other thread got me hankering for some Fenderishness at a bargain. I bought a Squier CV Tele at Guitar Center. It played superbly and I fell in love with the tones I was getting, but it was a boat anchor so I took it back and went to the Sweetwater site where they list the weights of their stock and I ordered the lightest one, a full pound and a half lighter than the one I took back. It is fantastic. I can’t believe how nice it plays. The Classic Vibe series proves that robots build a hell of a guitar. I was so smitten that I tried out a CV Stratocaster and was equally impressed. Found one on the bay for half the price of a new one. It came today and I'm once again blown away. To pay for this spree, I took a trunk load of unused guitars, basses and pedals to Atomic Music and sold them. I feel like a guitar glutton and I still have cash left over. Very nice score, Bob! That covers the bases nicely! I love a blackguard tele and an early-style maple neck "Brownie" Strat! Any cool BH basses down there now ? Where do you find guitar weights on the Sweetwater site? I just put a Bakelite pickguard on the tele with foil on the back. It seems to have taken care of the static crackle. After reading your post, Im thinking a Classic Vibe Tele is in my future. The Bakelite guard has a sonic advantage to it. A lot of great music was made on such instruments. Make more!! Thanks, NJ. Manny, that’s how they got me. Curt, the sounds are astounding. Of course, the Deluxe is also responsible. Enis, I will, I assure you! Congrats. I have heard good things about CVs. What guitars did you unload? 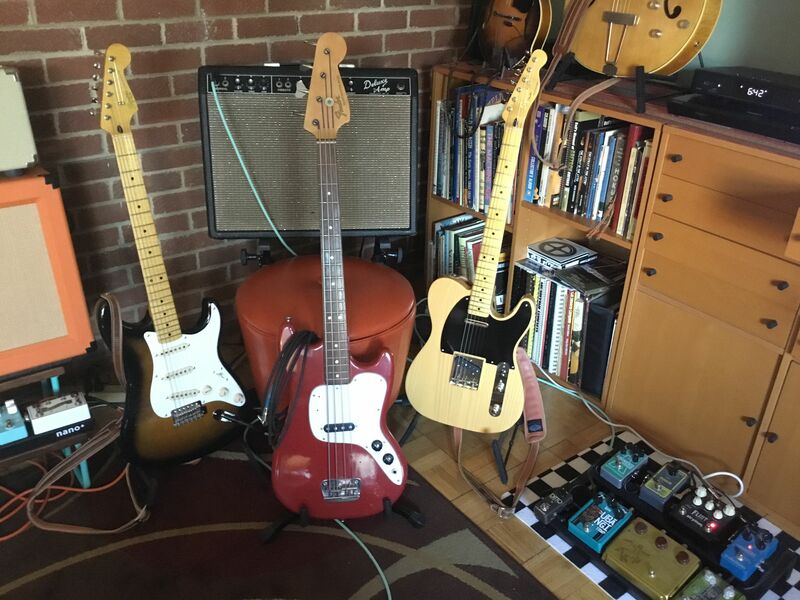 A Squier Bass VI, a Squier Musicmaster bass, a recent Electromatic Corvette and an beat to hell Silvertone ThinTwin that was beat beyond my ability and patience to fix. Those, plus some odd drums and a bag of pedals. It’s early, impatient spring cleaning. And the impending spring brings on this Fenderish obsession. I’m reveling in playing these spanky single coils through that 1964 Deluxe. What tone! Right under my fingers! That is the same tone one would use on a puppy who had an accident on one’s rug. I really like the way Sweetwater puts the weights and actual pics of their guitars. It says nothing about how it plays or the tone of that particular piece of wood but it's good info when you're trying to buy online. I take it back. I didn't realize the extent of your unloading. Reckon you done good. I would not want to recount my shipping and receiving in the last 90 days. Jim, the Sweetwater posting pics and weights thing wouldn’t help much when buying a hand made, high end guitar, but with these robot made ones, although it is clever gimmick, it served me well this time. Prot, buying the recent Squiers, the Bass VI, the Corvette were direct results of GDP threads. So was my beloved Dyna Jet and my Airline Tuxedo, which I’ll never sell. It’s a fun if an expensive hobby, but not as expensive as most mid-life crises. You all are enablers and I appreciate it. Good work, Bob! Enjoy them Fender/Squires. . . Another Squire to consider: The VM Jag or Jazzmaster. Just sayin' . . . I do have some budget left. Maybe I should check some weights at Sweetwater. Edit: Squier doesn’t seem to make Jags/JazzMasters in the Classic Vibe series. They are in the Vintage Modified series, and SW is out of them. I had one for awhile but I traded it back to the fellow I got it from. It was quite heavy. 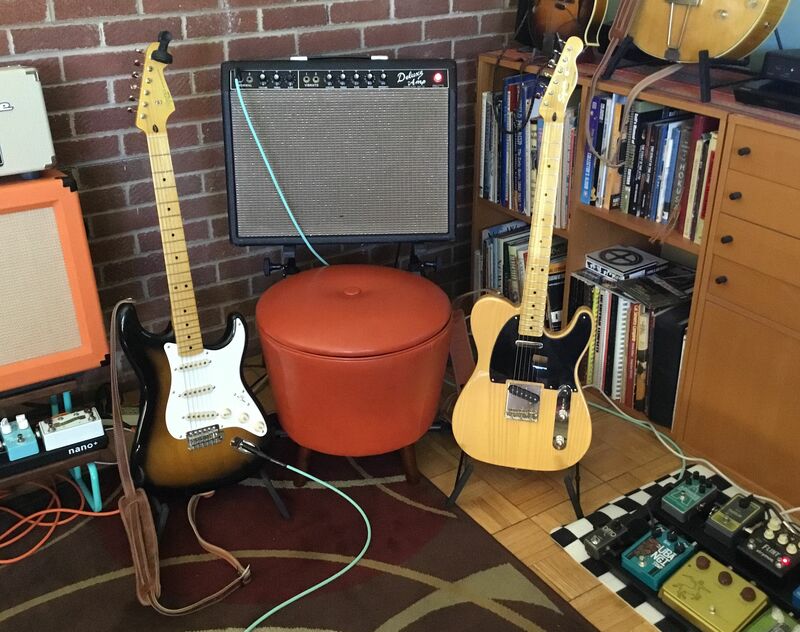 I'm still searching for a Tele myself,but every Squier i've played over here is like a boat anchor ,and they have pencil thin necks.